Today, I installed Librecad for a specific task. And it’s installed. Now use it. In my previous blog, I gave the introductory part of the GRASS GIS. So, it,s time to use it. I have created a txt file survey.txt containing some coordinates. To see the raster map, contours let study grass. I run a bash script in “myG.sh” that contain the commands to show raster map and contours. Digital Terrain Model (DTM) is raster map. fieldData and ContourVec is vector map. To plot profile of a map. Here’s is the display of the map. You are done. My Sir and Amarjeet really helped me a lot in it. Now, explore it more and have fun. GRASS GIS, commonly referred to as GRASS (Geographic Resources Analysis Support System), is a free and open source Geographic Information System (GIS) software suite used for geospatial data management and analysis, image processing, graphics and maps production, spatial modeling, and visualization. GRASS GIS is currently used in academic and commercial settings around the world, as well as by many governmental agencies and environmental consulting companies. It is a founding member of the Open Source Geospatial Foundation (OSGeo). Platforms: Linux, Macintosh, Sun Solaris, Silicon Graphics Irix, HP-UX, DEC-Alpha, and Windows OS. A LOCATION is simply a set of directories which contains the GRASS data of a project. Within each LOCATION, a mandatory “PERMANENT” MAPSET exists which contains projection information and some more definitions. It can be used to store the base cartography in it as “PERMANENT” is visible to all users accessing a LOCATION. Each LOCATION can have many MAPSETs. Each MAPSET is a LOCATION’s subdirectory. New MAPSET can be added at GRASS startup. One motivation to maintain different MAPSETs is to store maps related to project issues or subregions. Another motivation is to support simultaneous access of several users to the map layers stored within the same LOCATION, i.e. teams working on the same project. For teams, a centralized GRASS DATABASE would be defined in a shared network file system (e.g. NFS). Besides access to his/her own MAPSET, each user can also read map layers in other users’ MAPSETs, but s/he can modify or remove only the map layers in his/her own MAPSET. Yeah, a small challenge to change the colors of OSM map is solved. For this change your “palette.mss” file. I changed the color of buildings(to red), primary_line(to green), secondary_line(to green), road_halo(to black),standard_fill(to black). And after that I run the command. Then after searching a lot I took a risk to delete the folder “default” in /var/lib/mod_tile. It means I deleted the previous tiles created in the tile directory and again re-render the tiles. While I was searching for changing colors in my osm map. I got some useful information regarding OSM. OSM data is coming from shp files and postgresql database. .py means python file. I don’t knew about it beforehand. 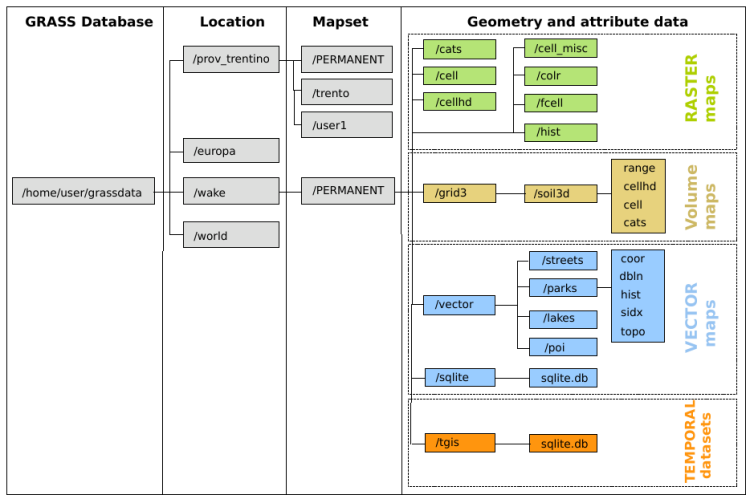 Purpose of render.py is used to render the map through mapnik. Size of the tile is defined in this file. osm.org is a slippymap. I told about slippymap in my previous blogs. OpenStreetMap layer tagging is converted by Osm2pgsql into a z_order parameter in the PostGIS/PostgreSQL database. The term “Z-order” refers to the order of objects along the Z-axis. An analogy would be some sheets of paper scattered on top of a table, each sheet being a window, the table your computer screen, and the top sheet having the highest Z value. Command:- The below command tells which tiles are rendered and when it is rendered it prompts DONE TILE message shown below. Variables are case-sensitive, just like filename in Linux. I added the cafe named “oreo” near “Lipton” cafe in Guru Nank Dev Enginering College.